One of the most challenging aspects about cooking as a college student is that you’re typically only cooking for yourself and so there tends to be a lot of waste. You make a tray of lasagna on Monday and you have to eat it for every lunch and dinner all week to get rid of it. But since no one enjoys eating the same thing at every meal (unless you are a freakish creature of habit), it usually ends up getting left in the fridge until a roommate complains about the smell and makes you throw it away. I’ve found that the best solution to this wasteful dilemma is to cook soup! You can make a large pot of it and store a desired amount in the fridge for the week, and then freeze the rest in individual serving-sized plastic ware. This week I was craving something hearty and healthy, and I decided to experiment with Thai flavors. I always order Tom Kha Gai soup to start at Thai restruarants, which is a lemongrass chicken soup (sometimes made with coconut milk), and I wanted to create my own version at home. I don’t really know how to cook Thai, but since I love to eat it so much, I am familiar with the flavors and how to combine them. What I didn’t take into account was how hard the ingredients are to find, how expensive they become, and how difficult and unusual they are to work with! I went to Whole Foods, and $80 later, I had a had 4 large bags filled with enough groceries to open a small Thai restaurant myself. Since I couldn’t find a recipe that I liked online, I decided to combine aspects of 4-5 different ones I saw, and create my own. I felt like a little kid, just throwing things into the pot as I went, but it turned out awesome! 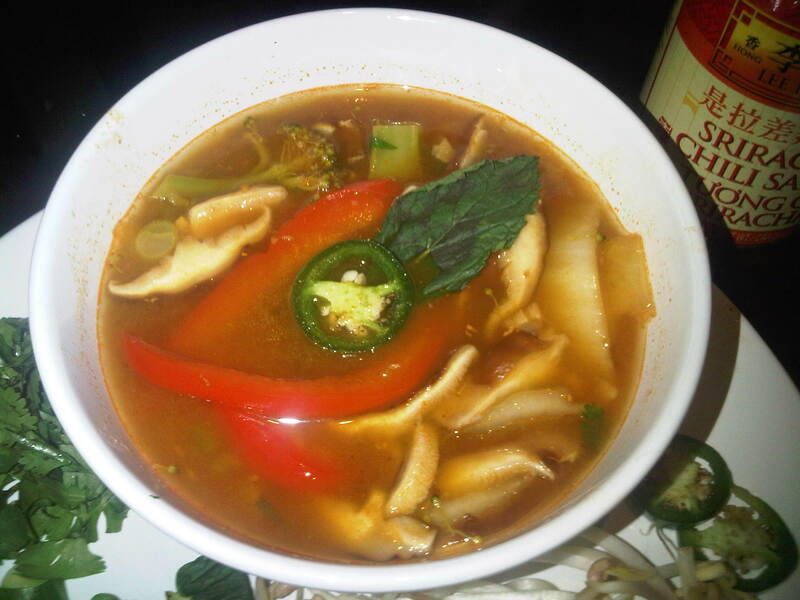 I used a lot of really great vegetables, and the broth has an awesome spicy lemongrass flavor. 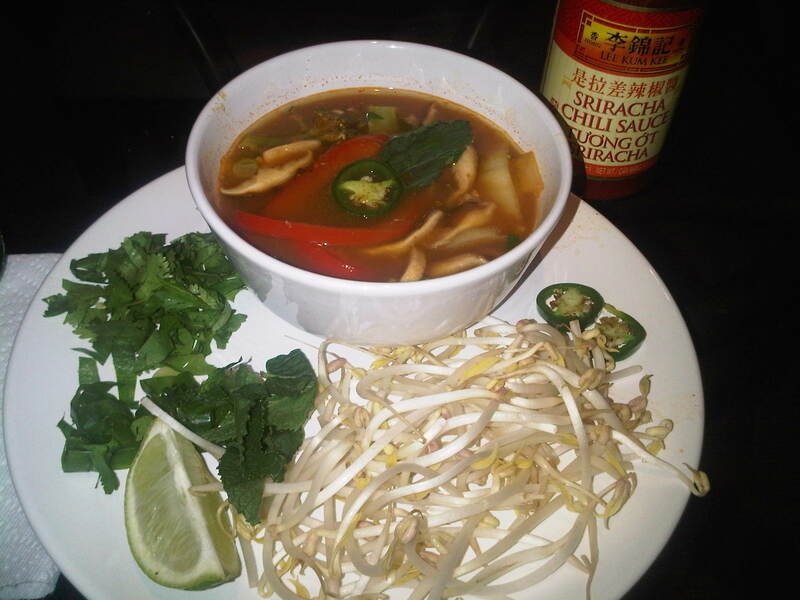 To serve the soup, I took inspiration from Vietnamese Pho and garnished the bowl with bean sprouts, cilantro leaves, jalapenos, lime wedges, and Siracha hot sauce. I ate the vegetables with my chopsticks in my right hand and held a spoon for the broth in my left! None of this soup made it to the freezer, because I looked forward to eating it for every meal of the week (I also shed some pounds, because it is super lo-cal!). Hopefully, you will enjoy the recipe! In a large stock pot, combine the vegetable stock, chicken stock, and lemongrass pieces. Bring to a boil for 5 minutes. In a small pan over medium-high heat, warm the vegetable oil and then sauté the garlic and ginger for about 2 minutes, or until fragrant but not burnt! Add the Thai red curry paste and combine mixture over heat for 2 minutes. Add the garlic, ginger, curry paste to the broth in the stockpot and stir well. Add the broccoli, red peppers, jalapenos, and zucchini. Allow to boil for 5 minutes and then reduce heat to low. Add the cabbage, green onion, and shitake mushrooms and allow to cook for 3 more minutes. Remove pot from heat and stir in soy sauce, lime juice, and cilantro. Season to taste with these ingredients and serve in individual bowls with garnishes.